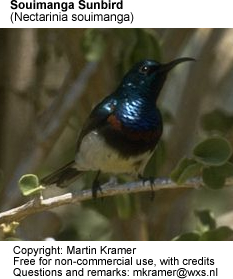 The Souimanga Sunbird (Cinnyris sovimanga) is a small passerine bird of the sunbird family. It is native to the islands of the Indian Ocean where it occurs on Madagascar, the Aldabra Group and the Glorioso Islands. There are five subspecies. The nominate subspecies C. s. sovimanga is found across most of Madagascar and on the Glorioso Islands. In south-western Madagascar it is replaced by C. s. apolis with C. s. aldabrensis on Aldabra atoll, C. s. abbotti on Assumption Island and C. s. buchenorum on Cosmoledo and Astove. The forms abbotti and buchenorum are sometimes considered to be a separate species: Abbott's Sunbird (C. abbotti). The Souimanga Sunbird is 10 cm long with a wingspan of 13 cm. The black bill is long, thin and curved. Males of the nominate form have a metallic green head, back and throat. The breast is blackish with a red band while the belly is yellow and the wings and tail are brown. There are yellow tufts at the sides of the breast which become visible when the birds lift their wings in courtship display. Males are duller outside the breeding season. Females have grey-brown upperparts, a dull yellow belly and a grey throat and breast with darker markings. Juveniles are similar to the females but duller with a black chin. Abbott's Sunbirds are larger - 11 cm long with a 14 cm wingspan. The males have a broader red breastband and there is no yellow on the underparts which are dark brown (on Assumption) or blackish (Cosmoledo and Astove). The species has a chirruping flight call and a loud, hoarse alarm call. Only the male sings; a fast and scratchy song with frequently repeated phrases. 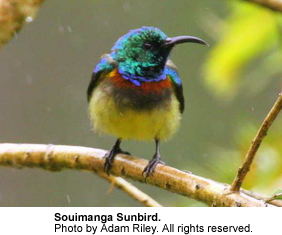 Souimanga Sunbirds are common across most of their range and can be found in a variety of habitats from mountain forests to mangroves and scrubland as well as in parks, gardens and other human-modified habitats. They use their curved bill to probe flowers for nectar and also feed on insects and spiders. They have few natural enemies and their nests are inaccessible to most predators. The long breeding season lasts from August to March. The nest is dome-shaped and has an entrance hole on the side. It is made of plant material such as grass stems, coconut fibre and leaves. It is usually suspended from a branch about 1 to 2 metres above the ground but may be built on a building or in a sinkhole within eroded coral. Two eggs are laid and are incubated for 13 to 14 days; they are whitish with reddish mottling. The young birds fledge after 16 to 18 days. Nest-building and incubation of the eggs are done by the female who also plays a greater role than the male in feeding the chicks.